The Safe Lock raised toilet seat adds 4.25 in of height to a regular toilet and features a wider opening, curved design and a smooth, high-quality finish. 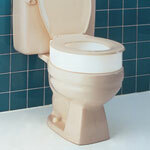 The Safe Lock system securely attaches the seat to the toilet. No tools are required for installation. Seat measures 14.50 in x 16.63 in x 4.25 in and weighs 2.55 lbs. Supports up to 500 lbs. The opening dimensions are 10 in x 9.75 in. Easy to clean design fits standard and elongated bowls. Three locking mechanisms keep seat securely in place. Available in white.